I run a seminar series for undergraduate math majors. Our most recent speaker was a graduate student, Brian, a gifted teacher and speaker. He spoke about magic squares. 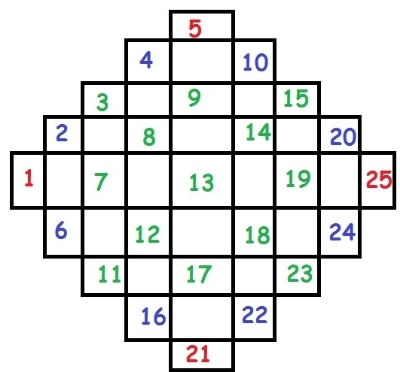 Magic squares are square grids filled with distinct numbers (no repetitions) that along each row,and column, and across the main diagonals the numbers add up to the same sum. They can be 3 by 3 grids, 4 by 4, 5 by 5, or in general n by n.
Along the first row 2+7+6=15, the second row 9+5+1=15, and the third 4+3+8=15. Along the first column 2+9+4=15, the second 7+5+3=15, and the third 6+1+8=15. And along the diagonals 2+5+8=15 and 6+5+4 15. As he spoke a vague memory tugged at me, a memory from high school. I tugged back, drawing it out of hiding. At some point I knew how to construct magic squares with odd numbered rows and columns. While Brian's demonstrated the construction for even numbered rows and columns, in the back of my mind I continued to tug at the memory, trying to bring it to the forefront. Unlike many other memories since the brain bleeds, to my delight, this one not only was it to be found, but I could feel that it was well within reach. At one level, I wanted Brian to explain the construction of the odd dimensional magic squares, but at another, I wanted to discover it for myself. I wanted to prove to myself that I could resurrect the memory, with little to no help. I wanted to know that there was still hope that at least some of the memories that I thought I had forever lost, were there, to be discovered at some point. I was somewhat relieved when I realized that Brian's method of construction didn't quite ring a bell. It seemed a tad too complex to me. I vaguely remembered something more visual. I spent the next couple of days with magic squares simmering in the background. Finally last night, just as I was falling asleep it come to me. Afraid I'd lose the memory by the morning, as I have with so many memories, I shot upright, scrambled for a pencil and paper and constructed several squares 3 by 3 and 5 by 5. This morning, I constructed another. I feel like thumbing my nose at the bloody brain. The sum of the numbers along each row, column, and main diagonal, is 65.